To understand how Earth obtained the minerals and elements that ultimately gave rise to and support all life, we will look briefly at how Earth was formed. Earth is among the eight planets of our solar system that orbit around the sun. Earth is positioned third from the Sun (Figure 1). This location gives it certain properties and characteristics, such as having a hospitable temperature, being terrestrial Of or living on land (as distinct from air or water). or rocky, and having water in solid, liquid, and gaseous forms. All of these characteristics of Earth, and its location in our solar system, allow it to be the only planet known to support life. Seismology studies help us discover Earth’s layered structure. Adapted from "gravitational attraction." The Free Dictionary. Farlex, n.d. Web. 28 Oct. 2015. that led to the beginnings of the 8 planets. On Earth, the energy from these collisions diffused throughout the planet’s mass as heat, causing the planet’s surface to grow very hot and its interior to grow even hotter. At that time, 4.5 billion years ago, Earth was a body of hot molten liquid minerals. Through the process of differentiation, denser materials, such as metals, were drawn toward the Earth’s core by gravitational pull, and lighter materials (such as silicon, aluminum, magnesium, and calcium combined with oxygen) remained closer to the surface. This differentiation among particle size and density of Earth’s materials gave way to the planet’s layered structure. Earth has four primary layers (Figure 2): the core (outer and inner), the mantle (upper and lower), the crust, and the Earth’s atmosphere. Each layer has a different chemical and physical composition. Used with permission from Adam Dorman Pig's Ear Gear, Pigseargear.com. Legend altered for readability. Check out this short film demonstrating plate tectonics. Adapted from http://pubs.usgs.gov/gip/dynamic/tectonic.html, to slowly move on Earth’s surface and collide with one another. Read about the development of instruments designed to measure the gradual movements of Earth’s tectonic plates in this article from Earth Magazine. Tectonic plate movement is so slow that it is generally not detectable to humans without highly sensitive instruments. As these large pieces of the Earth’s crust move and collide with one another, the collision sites result in the development of mountains, where one land mass buckles under another, forcing the plate on top upward. 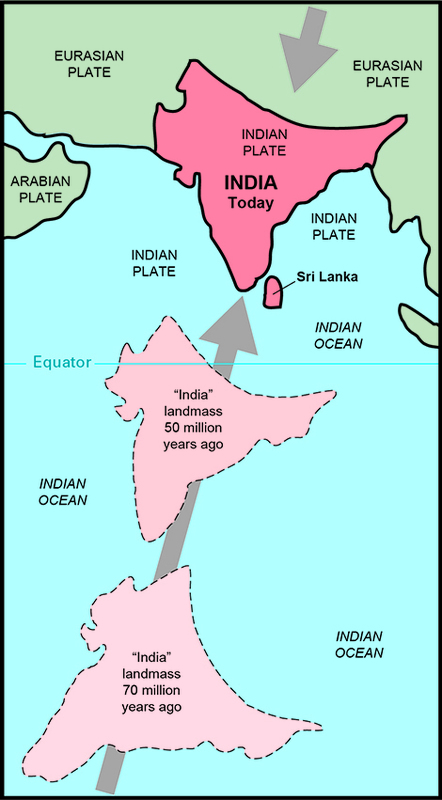 For example, 40-50 million years ago the land mass that we now call India was located south of the equator near Australia. It began moving north until it collided with what is now called Tibet, forming the Himalayan Mountains (Figure 3). The force of the Indian land mass collision was so great that India is still moving northward today, such that the Himalayan Mountains continue to rise at an average rate of 2cm per year. To learn more about this amazing phenomenon, go to “two continents collide”. Likewise, where tectonic land masses pull away from one another, the development of valleys and deep ocean trenches occurs. The edges of tectonic plates, where they push and pull against one another, are often areas where the greatest volcanic and earthquake activity is experienced. The majority of the world’s most powerful volcanoes and earthquakes come from the Ring of Fire, a seam between the Pacific Oceanic plate and the land mass tectonic plates that surround it stretching from New Zealand north to Japan, across to Alaska, and southward along the west coast of North and South America (Figure 4). The Ring of Fire has produced the most violent volcanoes, earthquakes, and tsunamis in our history. Take a look at this news story about The Really Big One, an earthquake and tsunami anticipated to hit the Pacific Northwest of North America within the next 50 years. Volcanic eruptions bring to the Earth’s surface many elements which were trapped deep within the Earth at the point of Earth’s formation, including silicon, aluminum, iron, magnesium, calcium, sodium, potassium, phosphorus, titanium, sulfur, and many other metals and non-metals. http://education.nationalgeographic.com/education/encyclopedia/lithosphe... (Figure 5). All of the available natural resources occur within these spheres. d. Atmosphere: Mohammed Tawsif Salam, This file is licensed under the Creative Commons Attribution-Share Alike 3.0 Unported license. When some people observe the incredible beauty and complexity of Earth's four spheres they feel they are experiencing something 'sacred'. We will discuss this phenomenon is the Spirituality Section of this chapter. Adapted from "sandstone." (n.d.) The American Heritage® Dictionary of Student Science, Second Edition. (2014). Retrieved December 7 2015 from http://www.thefreedictionary.com/sandstone in the Antarctic, where specialized algae and bacteria thrive (see Figure 6). While the resources that Earth provides come from the four primary spheres, some resources are also present at the interface of these spheres. For example, soil formation occurs at the interface of all four spheres where organic matter and living organisms (from the biosphere), air (from the atmosphere), water (from the hydrosphere), and weathered rock and mineral particles (from the lithosphere) combine. Figure 7 provides a flow chart of our basic natural resources (materials and energy) depicting the spheres that contribute to those resources. Cunninghame, William, Environmental Science: A Global Concern, January 31, 2008, p 584, McGraw-Hill Higher Education , through which elements change chemical form. This cycling of matter contrasts with the unidirectional flow of energy through Earth’s system. Energy from the Sun, which flows unidirectionally toward Earth, is transformed by different processes in the Earth’s spheres, and then flows out of Earth, usually in the form of dissipating heat. The hydrologic cycle, or the biogeo-chemical cycle of water, is detailed in the Water Chapter. Matter, on the other hand, moves through biogeochemical cycles where it changes form, but does not dissipate. Energy flows unidirectionally, and matter flows in cycles. Transformations of matter are kept in balance and remain repeatable through the natural biogeochemical cycles, and this is crucial in order to provide a continuous source of elements that are required for the maintenance of life. Before describing the biogeochemical cycles we will first look at the elements that exist on Earth, along with their properties.